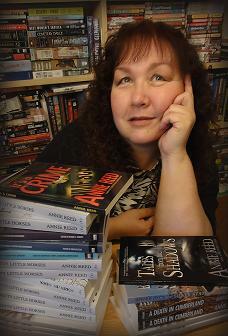 Award-winning, multi-genre author Annie Reed started telling stories to a tape recorder when she was still in elementary school. She used to script entire episodes of her favorite television shows and act them out in the backyard with her friends. Is it any wonder that her first sale was a Star Trek story to Strange New Worlds? Annie’s Star Trek stories appeared in two more issues of Strange New Worlds before she started branching out into into mystery and fantasy as well as science fiction, selling stories to Ellery Queen Mystery Magazine, and anthologies like Time After Time, The Trouble with Heroes, Swordplay, Cosmic Cocktails, Hags, Sirens and Other Bad Girls of Fantasy, The Future We Wish We Had, and Wizards, Inc.
Annie’s versatility led to her science fiction, fantasy, and mystery stories appearing in five of the seven volumes of Fiction River’s inaugural year. She also received a Literary Fellowship award for her story “One Sun, No Waiting” from the Nevada Arts Council, and her novel Pretty Little Horses was a finalist in the Best First Private Eye Novel contest sponsored by St. Martin’s Press and the Private Eye Writers of America. These days Annie divides her time between writing short fiction (her first love) and novels in whatever genre strikes her fancy. Her most popular fantasy stories, including her Diz and Dee fantasy detective stories, are set in a fictional version of Seattle called Moretown Bay. She has two mystery series: the Abby Maxon mysteries featuring Reno private detective and single mom Abby Maxon, and the Jill Jordan mysteries about rural Nevada Sheriff Jill Jordan. Annie’s background is as diverse as her writing. She’s been in a rock band, worked as a radio DJ, and taught tole painting. These days when she’s not writing, Annie spends her time in a law office working for a busy litigation attorney. She lives in Northern Nevada, and together with her husband and daughter, she shares her house with a number of high-maintenance cats. (Aren’t all authors required to be owned by cats?) A friend to backyard bunnies and kamikaze quail, Annie would probably befriend dogs, too, except they’d chase the rabbits. Author photo copyright © 2014 Katie Reed. Pingback: WMG story podcast: “The Shape of a Name” | WMG PUBLISHING INC.